This time the group was the Society for Creative Anachronism, or SCA. Dedicated to recreating the Middle Ages “as they should have been,” this group’s activities consisted of assuming medieval personas, dressing in costumes, and fighting, drinking and wenching according to taste. Local chapters organized weekend events with sword tournaments, craft competitions, dancing, and banquets, all conducted in mock medieval form. Members drove hundreds of miles to indulge in this silliness. On that June morning, having finished moving into my apartment, I wandered past a public park where I spied medieval action and, realizing I had just unpacked an Elizabethan costume (liberated in a prank on Franklin College’s theater department) I went home, put it on, and came back to join the revelry. 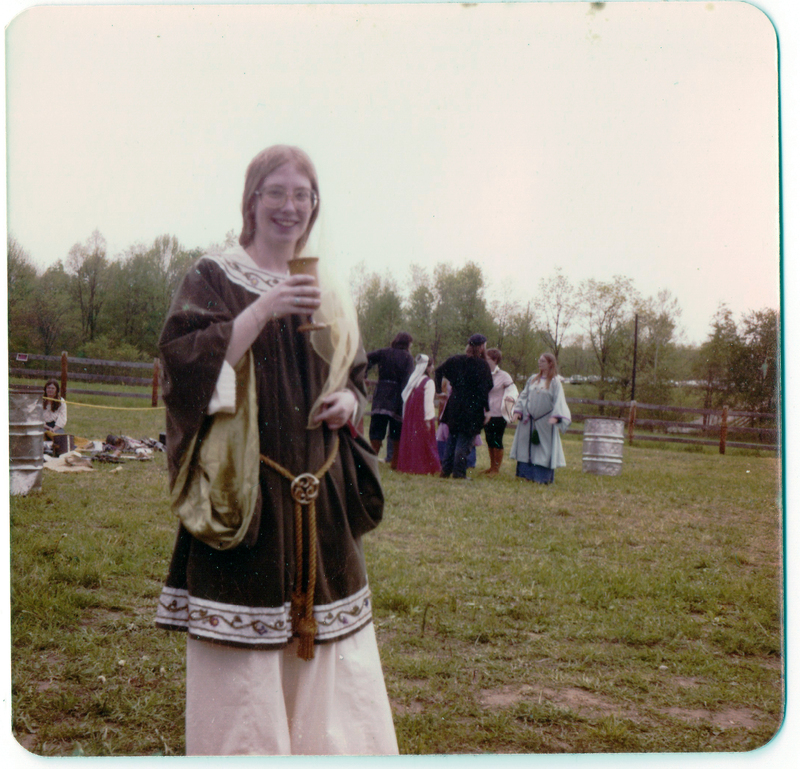 In no time I was attending meetings of the local chapter and developing my persona as Eluned engen Elvedorn, an Irish maiden circa 1200. The fall I turned 20 I was spending as much time on sewing and embroidering new costumes, practicing medieval ballads on my recorder, and learning flirtatious dances as I was on my schoolwork. As the business of the club unfolded around me—the election of officers, the undertaking of event planning—I recognized a parallel universe in which I could practice being a functioning adult without consequence if I got it wrong. In early 1977, the chapter I belonged to in Bloomington was due to host an event. I was asked to be the “autocrat” or organizer of it. Thinking that it could be a good management experience useful in some future unspecified career, I said yes. A date in late March was chosen and planning began. And then the lights went out. Jimmy Carter begged the nation to conserve oil. In Bloomington, the city government decreed that streetlights be turned off except on major arteries. I walked through the newly dark streets to meetings where we perseverated on whether to continue with our plans in the face of this energy crisis. Would it be unpatriotic to encourage those hundreds of car miles? And think of the energy we’d consume at the church hall we’d rent. The lights! The heat! The cooking, all those ovens on for hours! It was a new idea for me, patriotism. Up to that point I had mostly dedicated myself to being unpatriotic. (I had even desecrated a U.S. flag, sewing a surprisingly uncomfortable shirt from its flame-retardant fabric.) But one of the more remarkable aspects of the SCA was the way it brought people together from different circles and mindsets. There were born-again Christians, serious scholars, hippies, greasers, all mixed up in the colorful background of each other’s fantasies. The patriots among us strongly opposed hosting our event. I didn’t want to cancel, and neither did others cut from less patriotic cloth. But with the darkened streets and President Carter in his sweaters on TV, what was the right thing to do? Could we in good conscience continue with our obviously pointless recreation? In a meeting where secret ballots were tallied, I was given permission to go forward, with instructions to pursue every possible way to conserve energy. We agreed not to use the heat, and hoped for warm weather—in late March in Bloomington, it could go either way. We agreed to light the hall by candlelight. We emphasized carpooling in our invitations (which attendees did anyway, being impoverished students). The cooking we couldn’t do without, but we’d minimize energy where we could. Leading this group of misfits was like the proverbial herding cats. Delegation was not a skill I’d ever attempted—and turns out not to be one of my talents, then or since. Committees formed, more or less, around the needs of the day—organizing and judging various competitions, decorations, the evening banquet, entertainments for the revel to follow. The committees carried out their charges, to varying degrees. That banquet remains a vivid memory. The candlelight was beautiful, shining down the long banquet tables from tall torchiers borrowed from the church’s Christmas decorations. The effect was more authentically medieval than any event in SCA history. From an energy consumption standpoint, the net result of our patriotic intentions was probably negligible. But we cared enough to try, and that, for me, was a novel experience. I received compliments for months on the splendid atmosphere of that evening. And I received my initiation into organizational leadership. Who would have predicted, based on that modest leadership success, that I would later spend a decade of my life on the Association of Personal Historians board of directors—most recently, four years as its president? 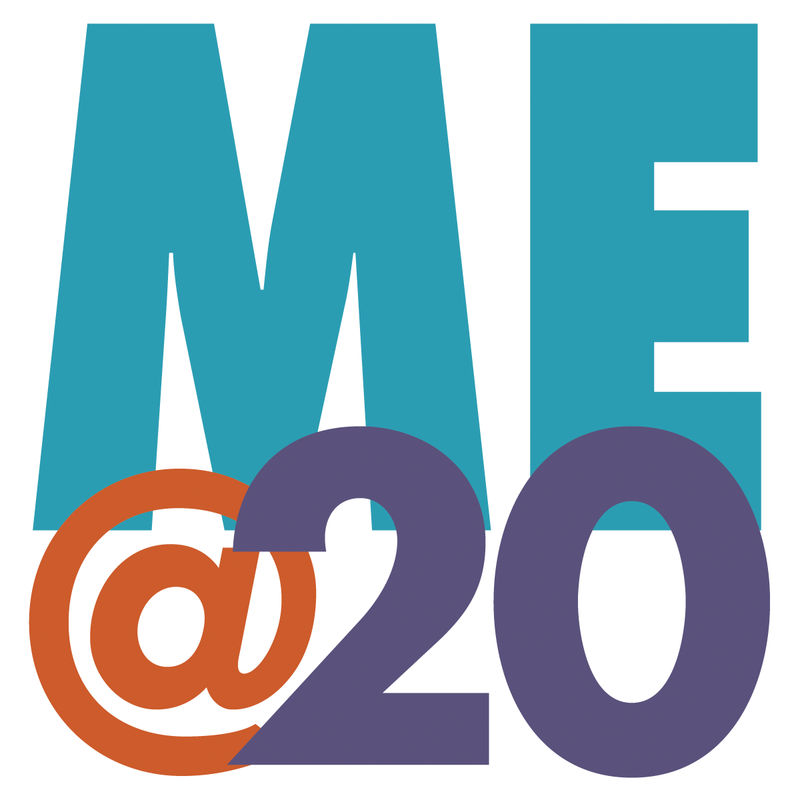 Follow these links to more “Me@20” essays by my friends in the APH. For more links to “Me@20” essays, check out this post on the APH blog. Me@20 Day celebrates personal history and the 20th anniversary of the Association of Personal Historians on May 20, 2015. APH supports its members in recording, preserving, and sharing life stories of people, families, communities, and organizations around the world. 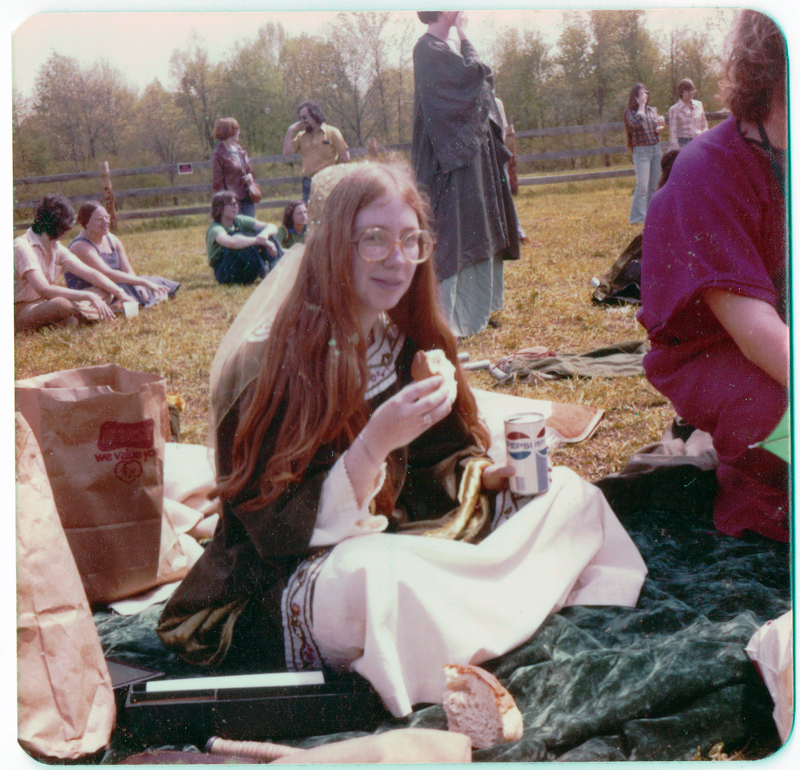 This entry was posted in Sarah's memoir, Writing prompt and tagged #APH20, 1977, Bloomington, IU, SCA. Bookmark the permalink. Me@20. What winding roads we take. But winding ones are the most interesting. A straight road has only one dimension and who wants that? The twists and turns we take give other dimensions and enrich the tapestry we weave. Well done Sarah! Great photos, Sarah, and what a story!! I love how you connect the dots of your earlier experience into the person you are today. It’s all there! Beautiful! Thank you, Madame President, for joining in the Me@20 fun. And thanks for the impetus for this campaign – you planted the seed after all!